Still a thing or fixed? I asked about it week ago and no update still or any info whatsoever. Edited by Sidushi, 03 October 2018 - 04:15 AM. This is still unfortunately a problem that we have continued to work on and purchase more hardware in an attempt at reproducing the issue so that we can fix it. We will absolutely make a big mention of this in future patch notes when this gets fixed as this is the toughest issue we have had to fix so far for Deadfire and will be ridiculously glad to not have to worry about it anymore. We sincerely do apologize for the problems, frustrations, and length of time this fix is taking and will continue to do what we can to resolve it. If you ever find any more information about this bug, please let us know so that we can look into your findings and get this fixed up. Thank you, and sorry for the inconvenience this has been causing. Thx for your post, i have a GTX1070 from the first wave with Samsung DDR5 VRAM. I will check it out later if i got memory leaks/fps drops too. Maybe it is 'Micron' problem. I ask myself if all my issues, mainly freezes, are down to my nvidia card when reading this. Stuttering (on a GTX 1070) frankly killed my enjoyment of this game, which I gladly backed. I was really looking forward to the DLCs, only to realise that the issue has yet to be fixed. I'm not about to purchase a new, potentially crummier GPU to replace a perfectly functional one, at least if we go by every other game in my library. Something needs to be done, and fast. Edited by ahmbor, 28 October 2018 - 01:26 AM. I have an Nvidia GeForce GTX 980 Ti & AMD FX 9590 Eight Core Processor with 16gigs ram. 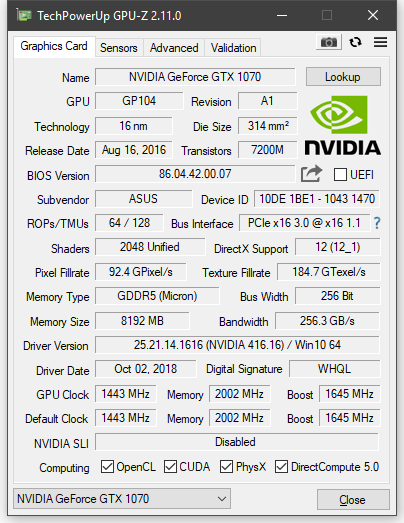 Task manager show the GPU pegged at 100% playing Pillars of Eternity 2. Really frustrating as I do love this game. I stop playing it because of the issues. So when can we expect a proper fix? If you want, PM me and I am happy to test / send more info / whatnot on my system. The 'Issues with Nvidia Graphics Cards' thread was pinned in June. Will December's 4.0 patch feature further graphical optimizations? I'd like to hear any news for this, too. Are devs still trying to fix this issue? We're still waiting. Any news? Yes has this been fixed or what? this is taking too long. Edited by johnmr531, 19 January 2019 - 08:26 AM. I'm sorry that this is still an issue for all or most of you. This is still our number one concern and programmers are still looking for ways to improve the performance issues on these Nvidia cards while we wait for help from Nvidia. I know there have been a few tweaks between the last few patches, but no "cure-all" fix yet. I am truly sorry that this is still an active issue for you and hope that we can get everyone running Deadfire the way it is intended. Sorry again for all the frustration this has been causing and thank you for your tremendous patience. Interesting, thank you. I'll give it a shot.